The newest hype: Colour-me Mandalas! 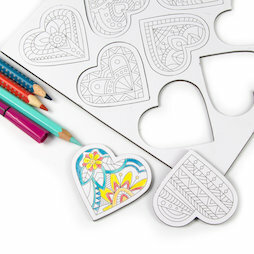 The cute pieces of art are magnetic and beautify the fridge or the magnet board. The round Mandala magnets can be coloured in with markers or coloured pencils and come in sets of 9. Each of the 9 round Mandala magnets features a different design. Colouring these round Mandalas is not just for kids either; it's a fun activity for adults as well. It relaxes and allows you to get lost in thoughts.